At this time of year we have to be concerned about high sugar levels in grass. If the horses are still on pasture, the sugars are elevated as the grasses prepare to harden off for the winter. 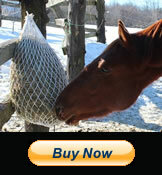 Another big concern is frozen grass colic. Many years ago, I had a horse colic from eating frozen grass. The grass becomes limp and just sits in the stomach, then colic. Please be aware of this very real possibility!!. I now offer 2 inch netting and am trying to build inventory. Please get in touch with me directly regarding your needs. Also, please take a look at the HaySmart Facebook page. I often post interesting articles there. Utiliser Google Translate pour traduire cette page.